It isn’t clear from the scriptures what time this occurred. Also, being a vision rather than a specific location, there is no set time of day for this scene. Light for this scene comes for the sun, which is on the left of the scene. 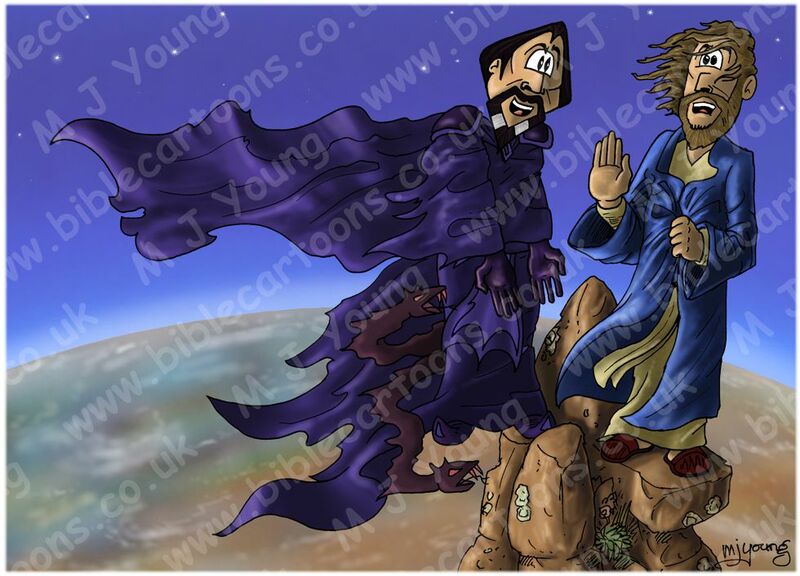 This is the third cartoon illustration I have drawn in this series of 6, showing the Temptation of Jesus the Christ by the Devil (or Satan.) As I noted in the first cartoons (scenes 03 – Stones & o4 – Temple) this is the first time I have drawn a personified Satan character. In the past I have drawn sketches in which Satan is a dark, cloud-like figure, vaguely human in appearance. I had thought to keep Satan depicted in that way, since he doesn’t usually tempt humanity by appearing in a physical body at all. I wasn’t even certain that it would be right to draw him with a physical body. But in the end I thought it would make the picture more interesting & dynamic if we could clearly see him. I have spent quite a few hours designing the Devil’s head & features. Again, I was torn between making him look like a villain: menacing, dark & mysterious, or depicting him like an angel: light, heavenly & attractive. The former would make it easier to “spot the villain” but the latter gives more scope to explain Satan’s deceptive ability: if we viewed him as an angel of light, then we would be more inclined to believe him, which is what he wants! The name Lucifer apparently refers to Satan, & is translated “star of the morning”, “bright star”, “day-star”, etc (see Isaiah 14:12-14). It would be equally possible to depict Satan as a bright, heavenly angelic being, given these names. I have given the Devil the same skin colour as Jesus the Christ, since I reason that Satan would like to usurp Jesus & in some way would like to be Him. Notice that I have given Satan snake-like pupils (the dark part of his eyes), which are long & thin. I wanted him to look arrogant, angry & deceptive in this particular scene. His hair & particularly his beard is very reminiscent of an actor called Roger Delgardo, who played “the Master” in Dr. Who from 1971-1973! Notice also that the Devil is standing on the edge of the mountain, & also in mid-air! He is referred to as the “Prince of the power of the air” (Ephesians 2:2 (New King James Version)) so I thought it appropriate to show him standing on thin air! In this scene Satan is gesturing towards his feet with open hands, motioning for Jesus to knee & worship him. Once again, Jesus is standing firm & holding up his hand, rejecting Satan’s temptation, as he did in the previous scenes. It is unclear from the scriptures whether this was a vision in Jesus’ mind, or an actual place that Satan took him too. Clearly it is impossible to stand anywhere on Earth & see all the kingdoms of the entire globe, so it may have been a temptation planted in Jesus’ mind. What was this third temptation all about? In the third temptation Satan tried to entice Jesus to take a shortcut in the Father’s plan for his life. It was and is God’s design that Jesus the Christ rule the world. So Satan showed Jesus the kingdoms of the world in all their splendour, & tried to entice Jesus to abandon his heavenly Father’s will (the mission of salvation which required his death on the cross) & simply take these kingdoms as his own. It is important to note that Satan does not own the kingdoms of the earth, however, he had usurped Adam & Eve’s rightful inheritance of the earth, back in Genesis, when they succumbed to his temptation. Satan is described (in 2 Corinthians 4;4) as “the god of this Age” and “the prince of this world” (see John 12:31; Eph. 2:2). Satan had the power to give the kingdoms of the earth to Jesus, but that required Jesus bowing down and worshipping him. Had Jesus taken that route, he would never have gone to the cross, which was God’s plan for the salvation of the human race. Jesus’ response, once again quoting from Deuteronomy (6:13 and 10:20), was that God alone should be worshipped and served. Jesus would never worship Satan since the Devil is a created being, & therefore inferior to the heavenly God who is eternal, all-powerful & all-knowing. Jesus resisted this last temptation, & his immediate testing was over. A note about the parallels of Satan’s temptations of Eve in the Garden of Eden & Jesus in the Judean wilderness. Interestingly Satan’s temptations of Eve in the Garden of Eden correspond to those of Jesus in the desert. Satan appealed to the physical appetite (Gen. 3:1-3; Matt. 4:3), the desire for personal gain (Gen. 3:4-5; Matt. 4:6), and an easy path to power or glory (Gen. 3:5-6; Matt. 4:8-9). And in each case Satan altered God’s Word (Gen. 3:4; Matt. 4:6). Satan’s temptations of people today often fall into the same three categories (cf. 1 John 2:16). The One who had identified Himself with sinners by baptism and who would provide righteousness proved He is righteous, and revealed His approval by the Father. Satan then left Jesus. At that moment God sent angels to minister to His needs.